Homeschooling during the holidays is always an adventure. You may go right along with your schedule as usual, and only take a few days off here and there. Or, maybe you shift the focus of your school entirely so that everything revolves around a central holiday theme. Whether you’re a holiday minimalist or a “We’ve got to do every single thing because this time of year is the BEST!” kind of homeschool mom, you’re probably excited to spend a few days at home snuggled up with some fun memory-making activities (that may even become traditions)! Art is definitely high on the list of memory making activities! And, with a little planning… you can even sprinkle in a little bit of art history art appreciation! If you’re looking for a steady stream of fun and engaging art history projects for kids - and also some videos that demonstrate how to use different art supplies, The Studio membership provides all of that PLUS access to our amazing community of creative homeschool moms. The membership is currently closed for public enrollment, but I’ll be sending an invitation to everyone on the waitlist this Friday! Add your name to the waitlist, and you’ll have an opportunity to hop in just in time to study Kandinsky with us next month! His art is bold and abstract, and our projects will be as dynamic and energetic as he was! Be sure to sign up for Art History Kids announcements… I have a really fun one coming next week! (I’ll give you a hint… it combines art history with The Nutcracker). Sign up with your email address to receive news about upcoming workshops, fun free activities, and sales! Let’s chat! 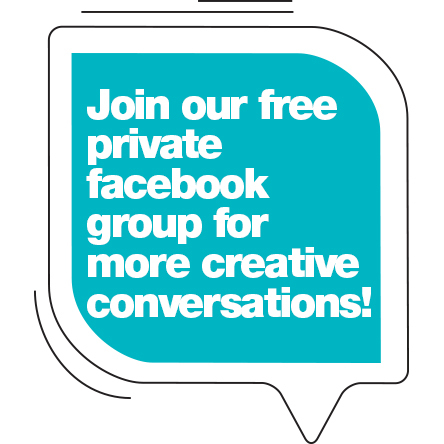 Our Facebook group is a great place to connect!